Autumn Statement: What does £2bn mean? The government’s direct funding of research—the so-called ‘Science Budget’—will experience significant real-terms cuts by the end of this parliament if current policies continue. The 2019–20 budget could be down by 7% in real terms, and nearly 25% as a fraction of GDP, compared to investment when the Coalition took power in 2010. With the government’s Comprehensive Spending Review on the horizon in November, it’s a good time to take stock of the Science Budget. This budget is the government’s main pot of money for direct funding of science through universities and research councils, and in recent years it’s hovered around £5.5bn, or £90 per UK resident. It makes up little over half of the UK government’s total funding of R&D. The Coalition’s Comprehensive Spending Review in 2010 froze the Science Budget in cash terms, whilst cutting ‘capital’ spending on buildings and research infrastructure. These cuts, combined with inflation eroding the core budget, meant that the budget was down by an average of 5% over the last parliament. Last year’s Autumn Statement saw the announcement of additional funding for capital and a small boost to the core budget, but this wasn’t enough to bring funding back up to 2010 levels: it’s down around 1.5% in real terms in this financial year. Since the Spending Review decisions haven’t yet been announced, we don’t know what’s going to happen to the Science Budget from 2016 onwards. However, we can make predictions assuming that current policy will continue. Under this scenario, inflation will continue to erode science funding in real terms, giving rise to a 7% shortfall by the end of the current parliament, in 2019–20. Looking at the budget in real terms takes inflation into account, but it ignores growth of the UK population and economy. Incorporating these is arguably pretty important when looking at all kinds of government spending. In the case of science, the fruits of research are felt, and its costs shared, between everyone in the country, whilst a larger economy affords the potential for increased investment. Including these factors, the erosion of the frozen Science Budget looks significantly more dramatic: by 2020, it will have fallen by 12% per person, and almost 25% as a fraction of GDP, when compared to 2010. These projections are based on forecasts for population growth, inflation and economic performance; the latter in particular are highly uncertain, meaning these projections should be interpreted with caution. However, continuing current policies around the Science Budget represents a sizeable real-terms cut, and this is likely to be more significant when considered as a fraction of GDP now that the economy is growing again. However, things could get far worse. Unprotected departments, including the Department for Business, Innovation and Skills which oversees the Science Budget, have been asked to prepare scenarios for 25% and 40% budget reductions, so this already substantial reduction in investment could be a best-case scenario. A 40% cut to funding would be utterly disastrous for UK science, even before inflation is taken into account. At Scienceogram, we don’t believe that comparisons with past spending are that useful in determining how much we should invest in science. For example, we spend mere pence per person per year researching deadly and costly diseases, and looking at the potential benefits of research in tackling these huge societal challenges should be the way that investment in science is set. However, it’s important to be aware of the political context within which funding decisions are made. With the Comprehensive Spending Review coming up soon, the Science Budget is what we’re fighting for. 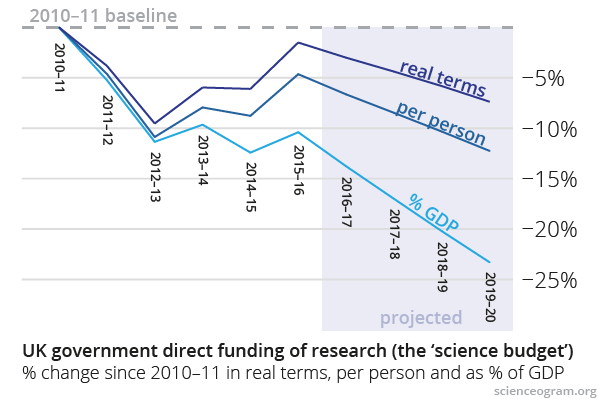 It’s clear from these figures, and the threat of even deeper cuts, that we urgently need government to reverse the decline in science funding. Watch this space if you want to help us get that message across. All the data used to make this infographic, along with working and a few other comparisons, can be found in this spreadsheet.